Has anyone else been anticipating Shirley's turn to the dark side for a while now? Well, good, because it is FINALLY happening! 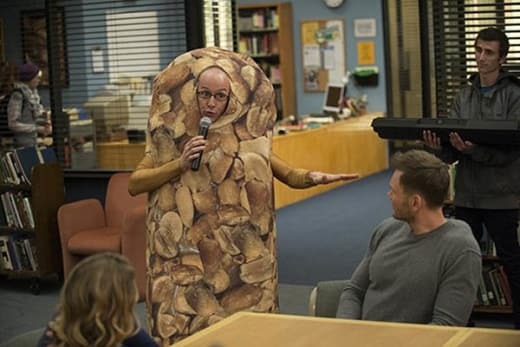 On Community Season 5 Episode 9, the gang got into the black market with some stolen textbooks, and Shirley revealed the brutaly efficientl businesswoman/ possible villain she's been hiding inside the whole time. In fact, an argument could be made that Shirley's only made whatever comes out that much worse by pressing it down all these years...and guys, I think it is definitely coming out! Not to say that this half hour is only (or even mostly) Shirley! There's epic conflict over Annie and Abed's picking of a new roommate! There's a cameo from Vince Gilligan! There's Chang with a bong, man! Stop reading this and go watch Community online! Like, right now! Annie: That's why Abed is like a brother to me. You guys are so alike. Abed: I can't accept that based on one time machine story. Permalink: I can't accept that based on one time machine story. You're like ice cream cake out there--overkill. Permalink: You're like ice cream cake out there--overkill.